The rib cage muscles consist of the obliques, intercostals and serratus anterior. Whenever you bend sideways or twist your body at the hips, these muscles get called into play. If you were to develop well defined rib cage muscles, they would give off the appearance of fingers on your sides. You can build up these muscles by executing the right exercises and using proper form. 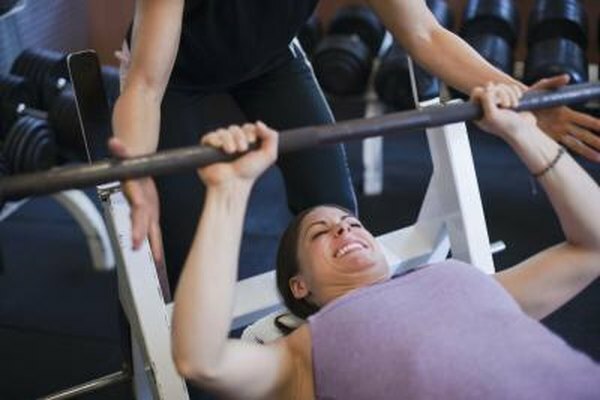 Execute a set of barbell pullovers on a bench. Lie perpendicular on the bench with your shoulders flat across the top, your knees bent and your feet flat on the floor. Your head should be over the edge of the bench but it should be in a straight line. Have a spotter hand you a weighted barbell and hold it directly above your chest with a shoulder-width grip. Keep your arms slightly bent and lower the bar over your head and toward the ground. Stop when you feel a strong contraction on your sides and push the bar back up. Stop when your arms are perpendicular to the floor and repeat. Attach a straight bar to a high setting on a cable machine to do serratus pushdowns. Stand facing the bar with your feet shoulder-width apart. Grasp the bar with an overhand, shoulder-width grip. Keep your arms straight as you push the bar down to meet your thighs. Let it go back up until your arms are parallel to the floor and repeat. Lie on a decline bench to do decline flyes. Anchor your lower shins under the padded support on the bench and lie flat on your back. Hold dumbbells an inch apart straight above your chest with your palms facing each other. Slightly bend your elbows and maintain that bend as you lower the weights down to your sides. Stop when you feel a strong contraction in your lower chest and rib cage area. Push the weights back up and repeat. Perform a set of side plank lifts. Lie on your right side with your legs stacked on top of each other. Place your left hand on your left hip and place your right forearm on the ground, perpendicular to your body and directly under your shoulder. Lift your hips up in the air as far as you can, then lower them back towards the floor. Stop about an inch away from the floor and lift back up. Repeat for a set of reps and switch sides. Make sure you keep your hips and shoulders in a straight line throughout the exercise. Kneel on the floor with an exercise ball in front of you to do rollouts. Place your hands shoulder-width apart on the ball and come to an upright position where there is a straight line from your shoulders to your knees. Roll the ball forward as you drop your hips toward the ground. Let your arms ride across the ball when you do this. Feel the contraction on your rib cage muscles and reverse the movement to get upright again. Keep your back perfectly straight during the exercise. Perform 12 to 15 reps and three to four sets of these exercises. Work out three times a week on alternating days. Work with a spotter to avoid accidents and injuries.